As a low cost, high speed stand-alone ECR or as part of an entry-level system, TX-500 combines exceptional performance with advanced security features. 58mm alphanumeric printer with graphic logo, numeric display and electronic journal. Can link to scanner and/or PC. 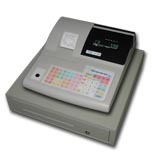 As a talented, high-speed stand-alone cash register or as part of an entry-level system, TX-500 combines exceptional performance with advanced security features at a remarkably affordable price.